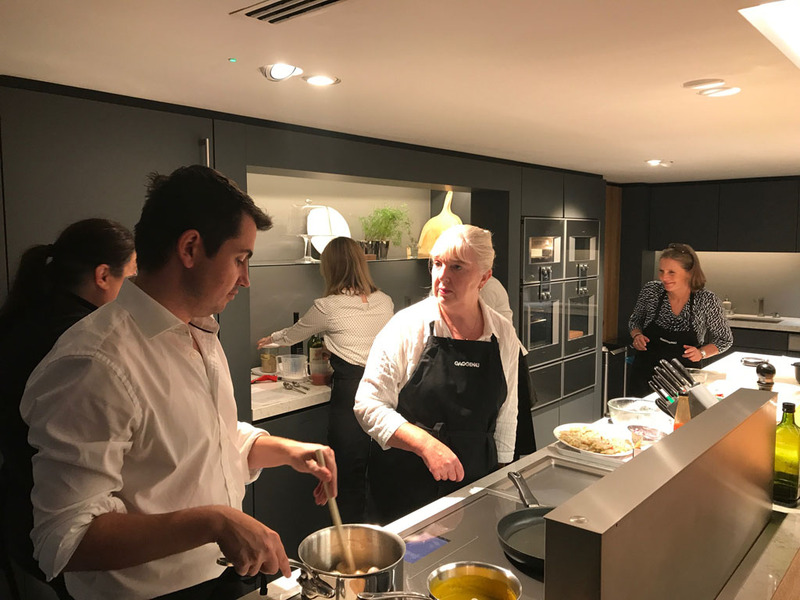 A number of McCarron & Co designers were lucky enough to attend a Gaggenau appliances evening training session held at their flagship London Wigmore Street showroom. Always a pleasure to spend some time with Fiona, Barbara and Kathy, the team were looking forward to a bit of light training followed by a 3-course evening meal. I had actually forgotten that to get to enjoy that 3-course meal, we were required to put our (questionable!) culinary skills to the test and make it ourselves. This would have been fine if a couple of glasses of champagne hadn’t preceded the cooking, and it all looked so easy when Kathy and Barbara were demonstrating too! 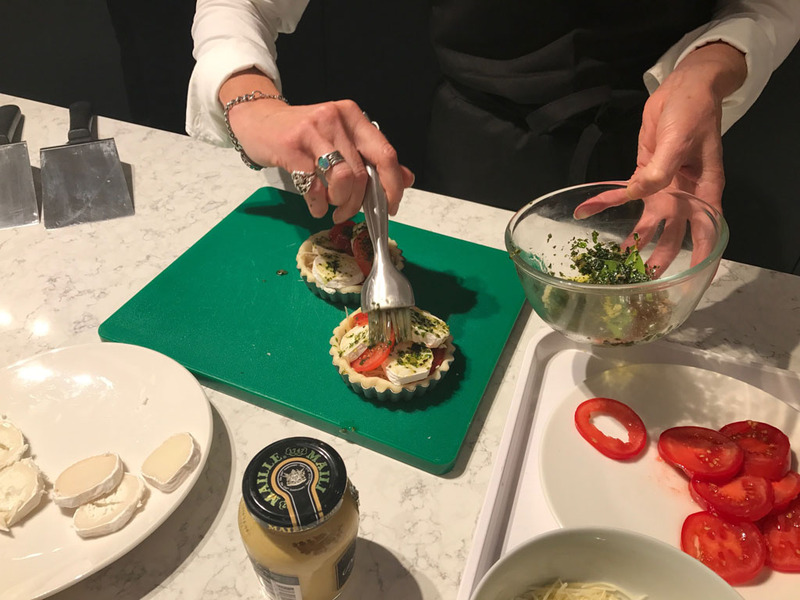 Aside from the entertainment value, the main reason for the evening was to refresh ourselves with the fabulous range of appliances that Gaggenau offer and in particular focus on a number of them that we would be using to cook with. I was particularly interested in having some more knowledge on Sous Vide cooking, something that has become very accessible to the domestic home, straight from the commercial kitchen. The precision control that Gaggenau equipped Sous Vide appliances possess mean that you can cook to a precise temperature for longer. The necessary gadget to make all this possible is the built-in vacuum drawer, in which any manner of food including meat, fish, vegetables can be sealed, and even marinated. In the case of our dinner, the main course which was a fillet beef, had been vacuum sealed and then slow cooked in the steam combination oven for 4 hours at low temperature. The taste was quite something – moist, tender and incredibly flavoursome, helped by the wonderful port shallot sauce. The evening also presented the opportunity to re visit an old friend – the wonderful multi-talented Teppan Yaki, where I was put in charge of cooking the skewered lemongrass prawns. The great thing about these evenings is that you always learn something new, and in my case, I hadn’t realised that the Teppan, although one stainless plate, is actually split up into 2 zones. This meant that when the prawns were cooked, they could be moved to the back section and be kept intact and not burnt! We all had our parts to play in the process and as you can see from the menu (opens in a new tab), the sum of the parts was quite incredible! The hard work done, it was time to sit back and enjoy the food and catch up on all things Gaggenau. If you’ve never visited the Wigmore Street showroom or haven’t been for a while, I would thoroughly recommend you do so. A complete revamp of the space back in the summer has led to the creation of a very inspirational setting, from which the entire range can be viewed and in our case tested. It’s certainly worth the demonstration of the vacuum drawer alone, something that we are considering putting on display in our Chelsea showroom. 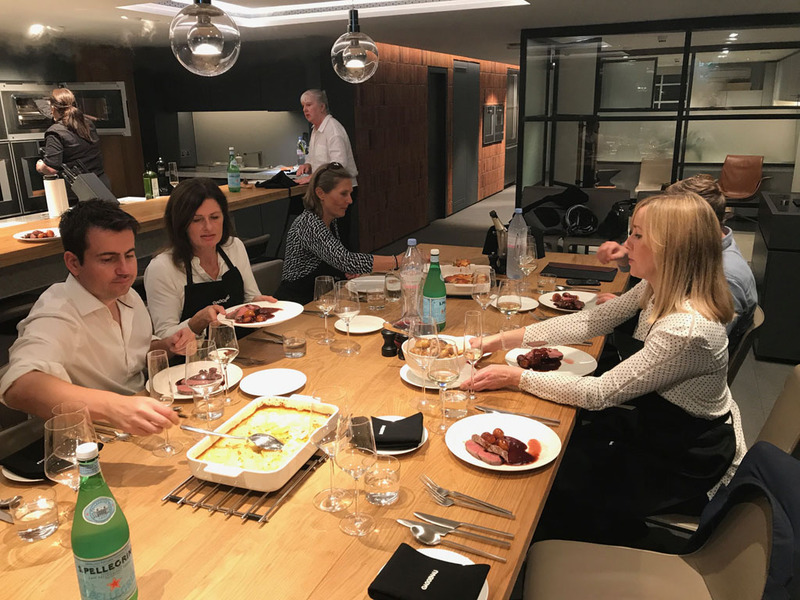 The knowledgeable, friendly Gaggenau appliances team are always on hand to help explain how to get the best out of their appliances, and if you’re lucky, they may even cook you something mouth-watering to eat! Our luxury furniture showrooms in London have a variety of Gaggenau appliances on display within our bespoke kitchen furniture room sets, which customers are welcome to see. Please call to arrange an appointment with our bespoke kitchen designers to discuss your project over a coffee or contact us at enq@mccarronandco.com.